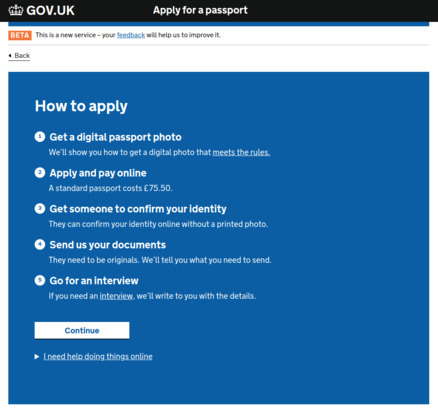 Two years ago, HM Passport Office (HMPO) introduced a new digital service to allow British passport holders to renew their passport online. Since then, around 2 million online renewals have been completed. Now, users can also apply for their first adult British passport online. This new service builds on the current digital renewal features which include the innovative photo upload tool, online declaration and clear guidance. Before this new service, users were often confused about what documents they needed, attending interviews and the process of getting their identity confirmed, known as a countersignature. The Digital Customer Services (DCS) team at HMPO worked to improve all these pain points. The new service provides users with contextual guidance throughout the application journey. For example, after answering some initial questions to confirm first-time passport status, users see step-by-step information about the process and what they’ll need to do at each stage. The new service also simplified the guidance about what documents must be sent in to support an application. Before, users had to figure out from tables what documents were relevant to them. Now, after answering some questions, they are shown a specific list of documents. 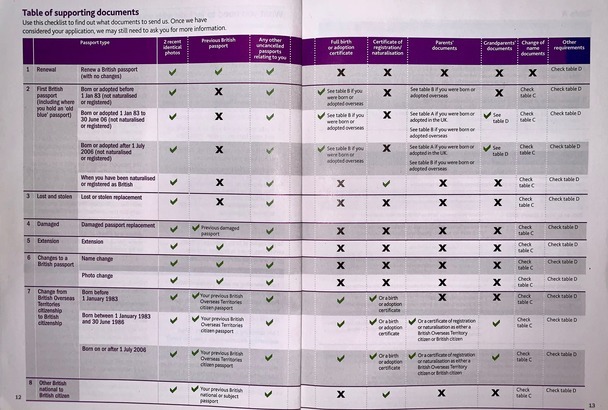 As well as being better for the user, the clearer guidance reduces the caseworker load, with less time spent time spent asking, and waiting, for the right documents. In a significant development for HMPO, the new service removes the need for users to get the back of their photo signed by a friend or colleague (countersigning an application). Instead, users give the name and email address of the person they would like to confirm their identity. The person then gets an email with a link and reference number. 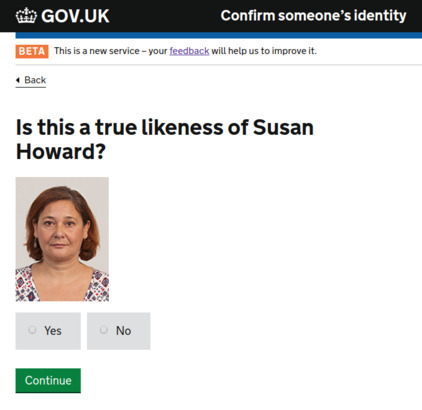 After using these to log in, the person answers some questions about the user and confirms that their photo is a true likeness of them. So far, the service has been well received by users, with positive feedback comments. It has also been shortlisted for 2 awards: the Best Customer Service Co-Creation/Collaboration category in the Institute of Customer Service UK Satisfaction Awards, and the Digital Award at the Civil Service Awards. 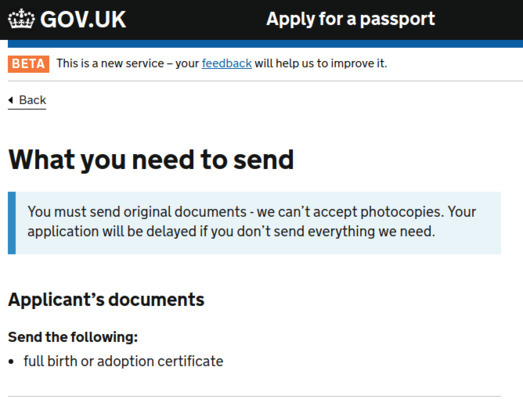 The DCS team is now building on the service to let 12 to 15-year olds renew and replace their damaged passport online. These new enhancements pave the way for the team to iterate and deliver more complex services, including first-time child and 0 to 11-year old renewal applications. Philippa Manley, Deputy Director at HMPO, said: “Opening our digital customer service to first time adult passport applicants is another huge step forward. "It’s been really exciting to see so many teams collaborating and building on this to tackle the more complex customer journeys, as well as continuing to improve the core service.